In the long-ago days of the 20th century, it was difficult to find out about small or medium companies that were far away: hard to discover they existed, hard to get details about their products and pricing, hard to place an order, and especially if the firm was in another country, hard to pay for an order and track shipping. That's all becoming easier, which suggests that small and medium enterprises may be able to draw on wider markets, and not be so focused on local markets. Thus, the World Trade Organization in its World Trade Report 2016 focuses on the theme of "Leveling the Playing Field for SMEs"--that is, "small and medium enterprises." 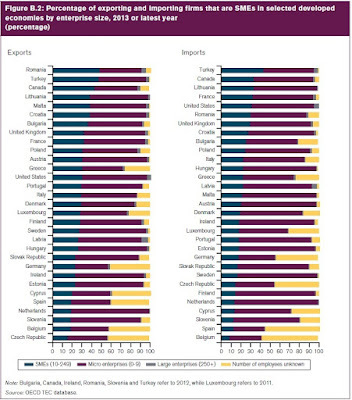 Much of the report focuses on practical issues affecting small and medium enterprises: connectedness, international trade rules, finance and others. Here, I'll just point to two patterns that I found intriguing. Here's a figure showing the share of exports and imports attributable to small and medium enterprises, which are defined as as employing 10-250 people (the blue bars), and also micro-enterprises (the gray dots), which are defined as employing 0-9 people. 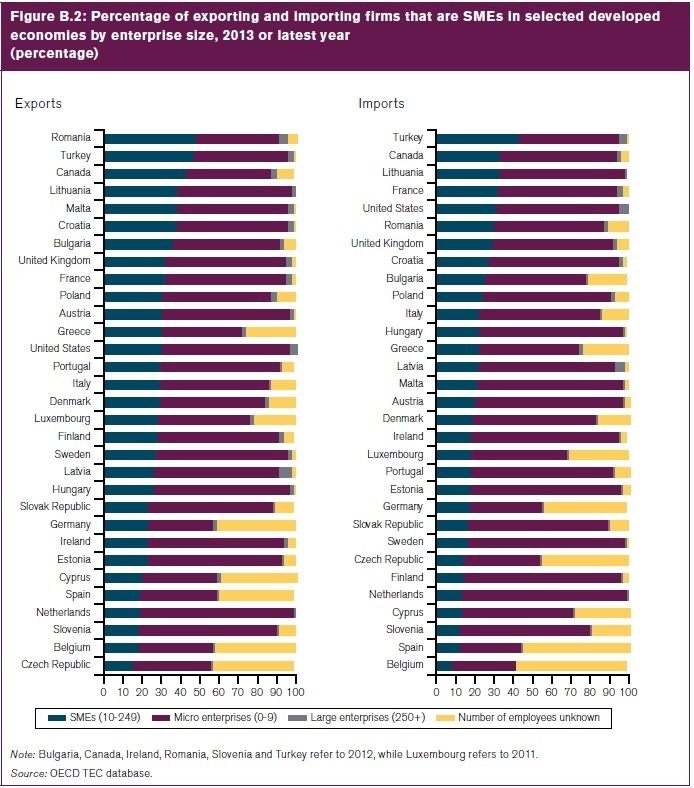 Unsurprisingly, the developed economies where small and medium enterprises have the largest share of their trade tend to be smaller European economies, like Estonia, Cyprus, and Ireland. 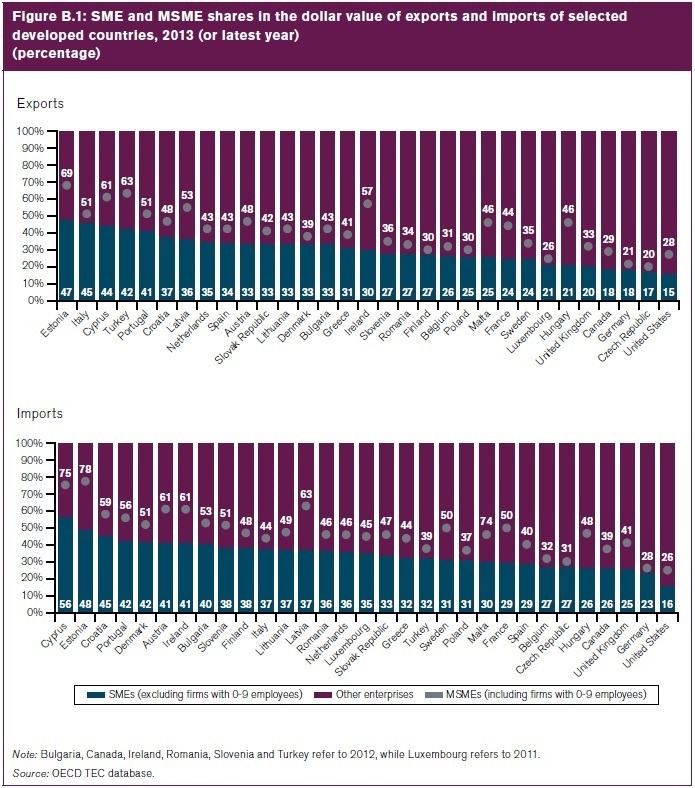 It's interesting that Italy, which is the fourth-largest economy in Europe, gets more than half its exports from micro, small and medium enterprises. 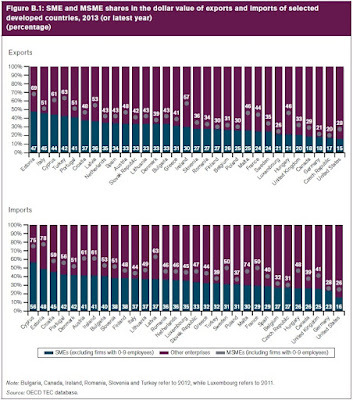 It does jump out at me that the US economy is by far the lowest for small and medium enterprises as a share of its trade. Traditionally, small and medium US firms focused on the enormous US market. It will be interesting to see how these patterns evolve over time. It seems as if the division of production across national borders into global value chains and the ability to export and import services, not just goods, should mean a larger role for small and medium enterprises in global trade. Or course, it will cause some of them to shift categories and turn into larger companies, as well. "Shadow banking" refers to financial organizations that in various ways receive funds from savers and lend money in financial markets--but are not banks. For example, a money market mutual fund receives money from investors, who can be thought of as "depositors," and then invest the money in bonds, which can be thought of as lending the money to whatever government or private entity issued the bonds. But it's not a bank! Alex Muscatov and Michael Perez of the Federal Reserve Bank of Dallas offer a nice quick overview of this sector in "Shadow Banking Reemerges, Posing Challenges to Banks and Regulators" (Economic Letter, July 2016). They offer a helpful table of sic types of nonbank financial entities: retirement funds, mutual funds, broker-dealers, alternative investment funds, financing firms, and insurance companies. 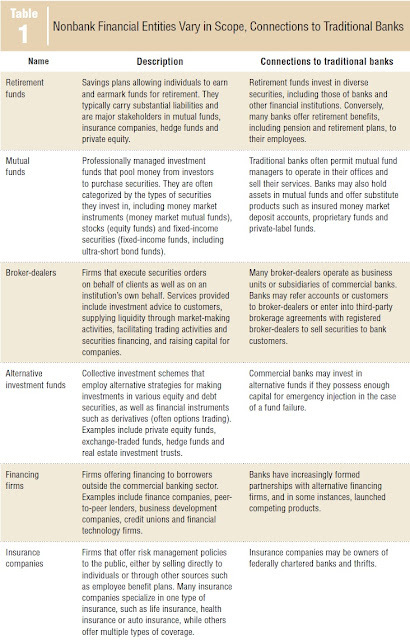 Here's a chart with a short description of each category and how it can be connected to traditional banks. 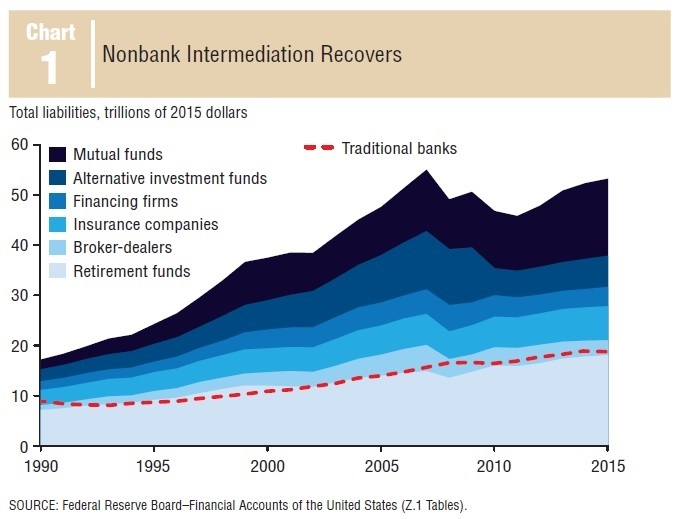 The NBI’s [non-bank intermediaries] importance has increased over the past four decades (Chart 1). In 1980, it accounted for roughly 40 percent of the domestic financial sector. As mutual funds’ prominence increased and life insurance companies fueled the markets for corporate bonds and commercial real estate, NBI growth greatly outpaced that of banks. By 1990, NBI accounted for two-thirds of the intermediation market and has continued to slowly gain share. Here's the Chart 1 to which they were referring. The red dashed line is the total liabilities of traditional banks. The shaded areas show the shadow banking or "nonbank intermediation" firms. Notice that before the financial crisis in 2008, liabilities of banks don't soar; after the crisis, they don't fall. The financial crisis instead happened in the shadow banking sector, where you can see the sharp rise in liabilities before the crisis circa 2008 and the sharp fall afterwards. "The chapter shows that across advanced economies the contribution of life insurers to systemic risk has increased in recent years, although it clearly remains below that of banks. This increase is largely due to growing common exposures to aggregate risk, caused partly by a rise in insurers’ interest rate sensitivity. Thus, in the event of an adverse shock, insurers are unlikely to fulfill their role as financial intermediaries precisely when other parts of the financial system are failing to do so as well." A US presidential election is, as the political science geeks like to point out, really 50 separate state elections, each one in a winner-take-all format. With the US national election day less than two months away, it seemed like a good time to review some (occasionally controversial) differences across how these state elections are conducted, which are compiled by the National Council of State Legislatures and available on its website. The first five states to require voter ID were South Carolina (in 1950), Hawaii (1970), Texas (1971), Florida (1977) and Alaska (1980). But during the last 15 years or so, the trend is clearly toward a a rising number of states imposing such requirements. The NCSL makes a couple of key distinctions between these laws. One is whether the requirement is for a photo ID (like a driver's license) or a non-photo ID (like a bank statement). Another distinction is whether the law is "non-strict" or "strict." Pretty much all voter ID laws offer some ways in which people without an ID can cast a provisional ballot, but the difference is whether that ballot will then be counted without further action by the voter ("non-strict"), or whether the person casting the ballot needs to do something after election day, like return to an election office and show a valid ID, before their ballot will be counted ("strict"). A state-by-state list of voter ID rules is available here at the NCSL website. Absentee Voting: All states will mail an absentee ballot to certain voters who request one. The voter may return the ballot by mail or in person. In 20 states, an excuse is required, while 27 states and the District of Columbia permit any qualified voter to vote absentee without offering an excuse. Some states offer a permanent absentee ballot list: once a voter asks to be added to the list, s/he will automatically receive an absentee ballot for all future elections. Mail Voting: A ballot is automatically mailed to every eligible voter (no request or application is necessary). In-person voting sites may also be available for voters who would like to vote in-person and to provide additional services to voters. Three states mail ballots to all eligible voters for every election. Other states may provide this option for some types of elections. The specific rules for early and absentee voting vary considerably across states, as well. Fopr example, the average starting time for early voting is 22 days before an election, but it varies across states from as much as 45 days before to just four days before. The average early voting period average is 19 days, but again, this varies across states from four to 45 days. Some states require that you give an approved reason for requesting an absentee ballot, while other will give an abstentee ballot to anyone who requests one. A state-by-state list of these rules is available here. "Thirteen states plus the District of Columbia presently offer same-day registration (SDR), allowing any qualified resident of the state to go to the polls or an election official's office, either before or on Election Day, register to vote, then cast a ballot, all in that day. California, Hawaii and Vermont have enacted same-day registration but have not yet implemented it. In most other states, voters must register by a deadline prior to Election Day. The deadline varies by state, with most falling between eight and 30 days before the election. ..."
"As of June 14, 2016 a total of 31 states plus the District of Columbia offer online registration, and another seven states have passed legislation to create online voter registration systems, but have not yet implemented them." "43 states permit a losing candidate, a voter, a group of voters or other concerned parties to petition for a recount. In a few states, the vote totals for the top two candidates must be within a specified margin in order for the losing candidate to be able to request a recount. For example, in Idaho, a candidate may petition for a recount if the difference between the requesting and winning candidates is less than 0.1 percent of the total votes cast for the office. In at least five states, a political party officer can request a recount, and in at least 17 states, a voter can petition for a recount. ... In most of the states that permit a candidate or other interested party to demand a recount, the petitioner is required to pay a deposit toward the cost of conducting the recount. If the recount reverses the result of the election, that person’s deposit is refunded. If the recount does not change election results, the petitioner is required to pay most of the costs associated with the recount. Automatic recounts are paid for by the state or county that conducts the recount." There are many other differences in how states conduct elections: for example, differences in voter registration, how lists of eligible voters are maintained, the rules about primary elections, the number of polling stations on election day and the hours they are open, the qualifications for poll-watchers, the ways in which paper or electronic voting equipment is used, and more. It's useful to consider this wide variation across states, in part because for many of us it tends to challenge our preconceptions about how voting should happen. For example, it seems to me that voting by mail has the potentially important problem that many voters will find it harder to cast a truly secret ballot. But clearly residents of Colorado, Oregon, and Washington disagree. I'm not a big fan of early voting rules, because I think there's some value to people having a chance to change their minds right up to election day, rather than being pressured to lock in their vote early, but many states clearly disagree with this view. My home state of Minnesota tends to pat itself on the back for not having a voter ID law, but it's a useful exercise in humility to remember that most other states disagree on the merits of such a rule. In some ways, the differences across states in voting are a litmus test for how you feel about a federalist country in which state and local governments have a substantial degree of autonomy on many issued, including administration of elections, or whether you tend to favor greater control by the central government. Every now and again, I'll post a cartoon suitable for tacking up on a bulletin board, or blending into an economics lecture. This one is from back in 2008, from Dale Everett at the Anarchy In Your Head website, but I just saw it for the first time, so I pass it along. 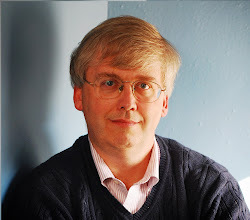 Addendum: A helpful reader points out that a similar comment was attributed to Ronald Coase by David Landes, who said in a 1983 symposium published in the Journal of Law and Economics: "Ronald said he had gotten tired of antitrust because when the prices went up the judges said it was monopoly, when the prices went down, they said it was predatory pricing, and when they stayed the same, they said it was tacit collusion." The citation is Edmund W. Kitch, "The Fire of Truth: A Remembrance of Law and Economics at Chicago, 1932-1970," Journal of Law & Economics, Vol. 26, No. 1 (Apr., 1983), pp. 163-234. Quotation is on p. 193. "More than 40 million people living in the United States were born in other countries, and almost an equal number have at least one foreign-born parent. Together, the first generation (foreign-born) and second generation (children of the foreign-born) comprise almost one in four Americans. It comes as little surprise, then, that many U.S. residents view immigration as a major policy issue facing the nation. Not only does immigration affect the environment in which everyone lives, learns, and works, but it also interacts with nearly every policy area of concern, from jobs and the economy, education, and health care, to federal, state, and local government budgets." The number of immigrants living in the United States increased by more than 70 percent—from 24.5 million (about 9 percent of the population) in 1995 to 42.3 million (about 13 percent of the population) in 2014; the native-born population increased by about 20 percent during the same period. Annual flows of lawful permanent residents have increased. During the 1980s, just under 600,000 immigrants were admitted legally (received green cards) each year; after the 1990 Immigration Act took effect, legal admissions increased to just under 800,000 per year; since 2001, legal admissions have averaged just over 1 million per year. Estimates of the number of unauthorized immigrants in the United States roughly doubled from about 5.7 million in 1995 to about 11.1 million in 2014. Gross inflows, which had reached more than 800,000 annually by the first 5 years of the 21st century, decreased dramatically after 2007; partly as a result, the unauthorized immigrant population shrank by about 1 million over the next 2 years. Since 2009, the unauthorized immigrant population has remained essentially constant, with 300,000-400,000 new unauthorized immigrants arriving each year and about the same number leaving. The foreign-born population has changed from being relatively old to being relatively young. In 1970 the peak concentration of immigrants was in their 60s; in 2012 the peak was in their 40s. Educational attainment has increased steadily over recent decades for both recent immigrants and natives, although the former still have about 0.8 years less of schooling on average than do the latter. 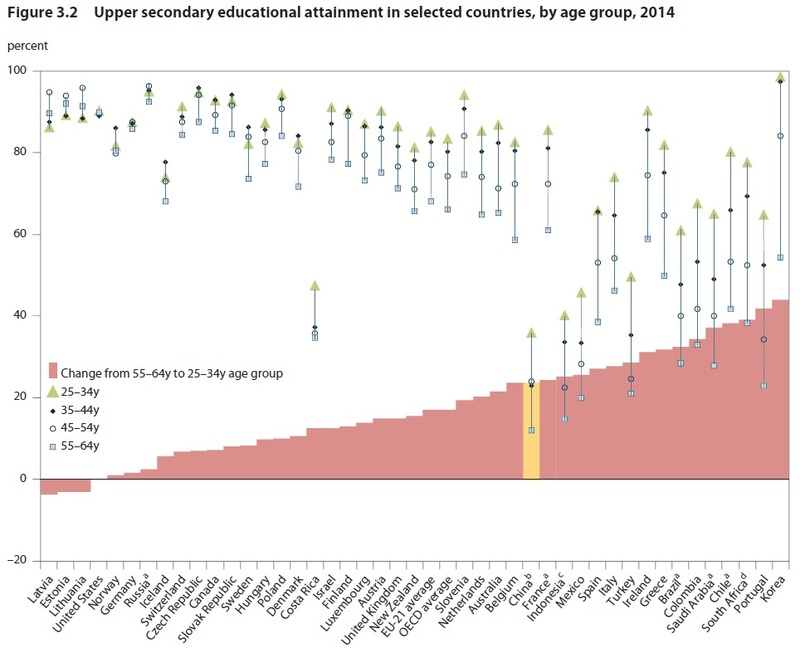 Such averages, however, obscure that the foreign born are overrepresented both among those with less than a high school education and among those with more than a 4-year college education, particularly among computer, science, and engineering workers with advanced degrees. The foreign and native born populations have roughly the same share of college graduates. As time spent in the United States lengthens, immigrants’ wages increase relative to those of natives and the initial wage gap narrows. However, this process of economic integration appears to have slowed somewhat in recent decades; the rate of relative wage growth and English language acquisition among the foreign-born is now slightly slower than it was for earlier immigrant waves. The children of immigrants continue to pick up English language skills very quickly. Geographic settlement patterns have changed since the 1990s, with immigrants increasingly moving to states and communities that historically had few immigrants. Nonetheless, the majority of the foreign-born population continues to reside in large metropolitan centers in traditional gateway states. "The literature on employment impacts finds little evidence that immigration significantly affects the overall employment levels of native-born workers. However, recent research finds that immigration reduces the number of hours worked by native teens (but not their employment rate)." "Until recently, the impact of high-skilled immigrants on native wages and employment received less attention than that of their low-skilled counterparts. Interest in studying high-skill groups has gained momentum as the H1-B and other visa programs have contributed to a rapid rise in the inflow of professional foreign-born workers (about a quarter of a million persons per year during the last decade). Several studies have found a positive impact of skilled immigration on the wages and employment of both college-educated and noncollege educated natives. Such findings are consistent with the view that skilled immigrants are often complementary to native-born workers, especially those who are skilled; that spillovers of wage-enhancing knowledge and skills occur as a result of interactions among workers; and that skilled immigrants innovate sufficiently to raise overall productivity. However, other studies examining the earnings or productivity prevailing in narrowly defined fields find that high-skill immigration can have adverse effects on the wages or productivity of natives working in those fields." "The contributions of immigrants to the labor force reduce the prices of some goods and services, which benefits consumers in a range of sectors including child care, food preparation, house cleaning and repair, and construction. Moreover, new arrivals and their descendants are a source of demand in key sectors such as housing, which benefits residential real estate markets. ... Importantly, immigration is integral to the nation’s economic growth. Immigration supplies workers who have helped the United States avoid the problems facing stagnant economies created by unfavorable demographics—in particular, an aging (and, in the case of Japan, a shrinking) workforce. Moreover, the infusion by high-skill immigration of human capital has boosted the nation’s capacity for innovation, entrepreneurship, and technological change." On the issue of how immigration affects government budgets and services, the research takes a variety of perspectives. For example, a single immigrant with a job, no children and law-abiding, tends to pay more in taxes (including sales taxes and income tax withholding) than consumed in government services. A high-skilled immigrant will earn more income and pay higher taxes than a low-skilled immigrant. An immigrant with children in public schools will consume more services. An low-skilled immigration with a lower income level who works long enough to be eligible for Social Security and Medicare will consume more in services. In thinking about how immigration affects government budgets and services, it makes a difference if one takes a short-run perspective of a year, or the typically accumulation of taxes paid and government services over a lifetime. These lifetime patterns will vary among first-, second-, and third-generation immigrants. Thinking about the costs of government services means that you need to think of immigrants as consuming a share of publicly provide goods like, say, national defense. With such complexities duly noted, the NAS report lays out some overall conclusions. For example, a standard finding is that over a lifetime, immigration has a positive fiscal effect for the federal government but a negative effect for state and local government. "For the 2011-2013 period, the net cost to state and local budgets of first generation adults (including those generated by their dependent children) is, on average, about $1,600 each. In contrast, second and third-plus generation adults (again, with the costs of their dependents rolled in) create a net positive of about $1,700 and $1,300 each, respectively, to state and local budgets. These estimates imply that the total annual fiscal impact of first generation adults and their dependents, averaged across 2011-13, is a cost of $57.4 billion, while second and third-plus generation adults create a benefit of $30.5 billion and $223.8 billion, respectively. By the second generation, descendants of immigrants are a net positive for the states as a whole, in large part because they have fewer children on average than do first generation adults and contribute more in tax revenues than they cost in terms of program expenditures." A different way to slice this data is to look compare first-, second-, and third-generation immigrants at different ages. consistently been more expensive to government on a per capita basis than either the first or second generation; this is attributable to the third-plus generation’s greater use of social security benefits." Another finding is that because immigrant over the last few decades have become better-educated, their fiscal effect has also improved. "Today’s immigrants have more education than earlier immigrants and, as a result, are more positive contributors to government finances. ... Whether this education trend will continue remains uncertain, but the historical record suggests that the total net fiscal impact of immigrants across all levels of government has become more positive over time." My overall sense is that immigration is overall a positive force for the US economy, and I support a allowing steady stream of legal immigration over time--especially high-skilled migrants who have already spent time in the United States being trained at US colleges and universities, or working in US-based firms. But I would also say that the positive economic effects of immigration are not enormous, and can be negative for certain subgroups. Moreover, I suspect that while our social controversies over immigration may often be phrased in economic terms, a lot of the heat and energy in these controversies arises from perceptions about non-economic consequences of immigration. The Premium Tax Credit is the carrot for buying health insurance. As the report notes: "The PTC is a refundable tax credit paid either in advance or at return filing to help taxpayers with low to moderate incomes purchase health insurance through the Marketplace." For the 2015 tax year returns filed in 2016, 4.8 million returns claimed the Premium Tax Credit, and for this group the total value of the ax credit was $14.3 billion. Over 90% of those returns also asked for the Advanced PTC, as pre-payment for the similar costs expected in 2016. The Individual Shared Responsibility Payment is the stick. As the report writes: "Taxpayers are required to report that they have “minimum essential coverage” or were exempt from the responsibility to have the required coverage. If the taxpayer did not have coverage and was not exempt, he or she was required to make an ISRP when filing a return." A total of 5.6 million returns includes the ISRP provision, and those returns paid an average ISRP of $442, which works out to about $2.5 billion in total. The report also evaluates how well the IRS has implemented these provisions, with the overall tone reflected in Chapter III, Area of Focus #9, "As the IRS Has Gained Experience in Administering theIndividual Provisions of the Affordable Care Act, It HasAddressed Some Previous Concerns But a Few Still Remain." Although the PTC and the ISRP often seem to have received a lion's share of the controversy, it's worth remembering that they are neither the most costly portion of the tax code affecting health insurance nor the most costly part of the Patient Protection and Affordable Care Act of 2010. Back in March, the Congressional Budget Office published a report on "Federal Subsidies for Health Insurance Coverage for People Under Age 65: 2016 to 2026," and I wrote a post here about the "Affordable Care Act: Costs of Expanding Coverage" (March 28, 2016). As CBO points out, by far the biggest tax provision affecting health insurance coverage is the tax exclusion for employer-provided health insurance--that is, when your employer pays for your health insurance, the value of those payments is not taxed as income. If those payments were taxed as income, CBO estimates that it would raise $266 billion in tax revenue in 2016. In contrast, the Premium Tax Credit providing a subsidy for low-income people to purchase health insurance looks relatively small. Also the biggest additional cost of the Patient Protection and Affordable Care Act of 2010 is not the Premium Tax Credit, but rather is the expansion of Medicaid coverage to more people, which CBO estimates raised the costs of Medicaid by $64 billion in 2016. Overall, the CBO reported that for the Patient Protection and Affordable Care Act of 2010: "In 2016, those provisions are estimated to reduce the number of uninsured people by 22 million and to result in a net cost to the federal government of $110 billion." As I noted in that earlier post: "If the fundamental goal of the act was to spend an extra $110 billion and subsidize insurance for 22 million more Americans, the law could have been a lot simpler and less invasive." audit survey forms independently. Most audit studies then schedule debriefing sessions in which an audit manager reviews these forms with each auditor to ensure that all information on the forms is accurate. Similar "correspondence studies" can be done by email, in which the pairs of people are distinguished by choosing names that are likely to imply race or ethnicity, but otherwise have broadly similar traits. As Oh and Yinger point out, these kinds of studies can be useful both for measuring discrimination, and also as a law enforcement tool. "Racial steering is defined to exist if, compared to the White auditor in the same audit, the minority auditor is recommended or shown houses in neighborhoods where the percentage of the population that is White is lower. As exhibit 7 illustrates, each HDS found evidence of steering. 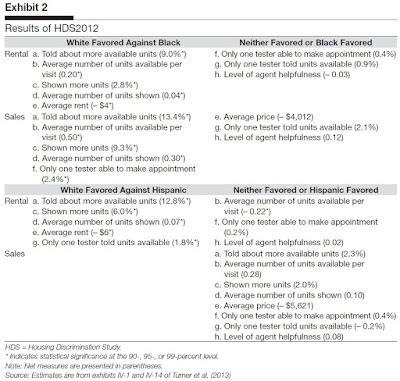 The gross estimates of steering in this exhibit range from 4 to 26 percent, and the net measures for both houses recommended and houses inspected are statistically significant for Black homeseekers in 2000 and 2012. The net measure for houses inspected is also significant for Hispanic homeseekers in 2000. ... [T]he incidence of steering has become larger over time." 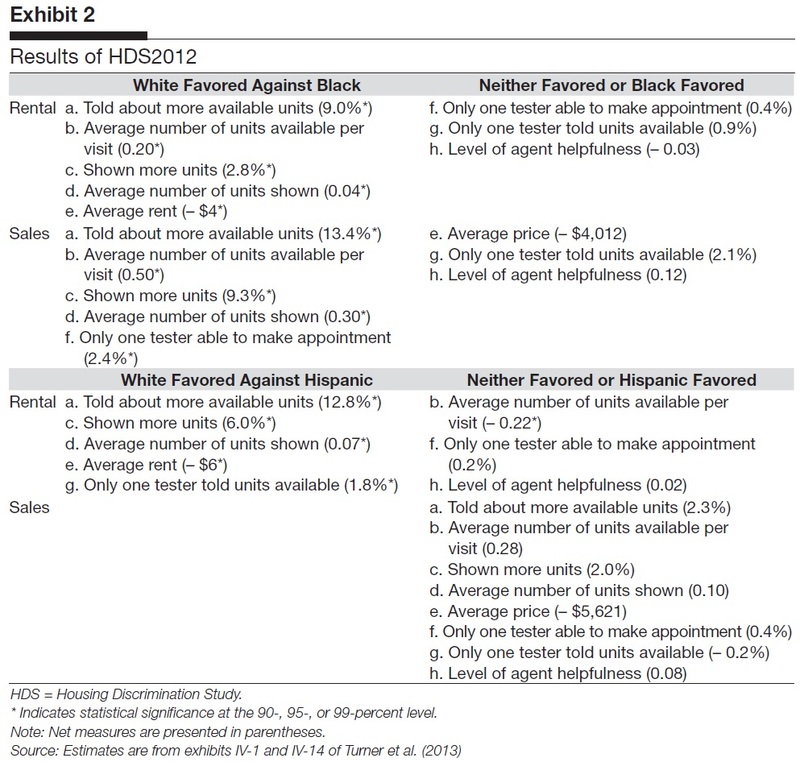 Notice that the paired testing method rules out the possibility that the homebuyers of different racial or ethnic groups are actively seeking out housing in different neighborhoods. Oh and Yinger discuss how this evidence fits with various hypotheses about discriminatory behavior. For example, are these outcomes a matter of prejudice from the real estate agent, whether consciously or not? For example, several studies find that older agents are more likely to be involved in discriminatory behavior. Or do the outcomes result from a belief by agents, acting without animus, that treating customers of different races and ethnicities in certain ways is more likely to lead to a completed transaction? Documenting patterns is relatively easy; disentangling motives is hard. But whatever the underlying reason, housing discrimination tends to promote segregation and is illegal. Paired testing studies are a useful tool for demonstrating the existence of such discrimination. The earlier studies in the 1970s and 1980s did seem to have a powerful effect on raising consciousness and enforcement efforts related to housing discrimination. Oh and Yinger report: "As of 2011, 98 private nonprofit agencies were engaged in fair housing enforcement." Moreover, the US Department of Justice has since 1992 been carrying out a Fair Housing Testing Program, which typically involves about four investigations per year. They cite recent cases in New York, Alabama, Arkansas, Pennsylvania, and Wisconsin, among others. Some studies of discrimination, like many of the studies looking at wage gaps between different groups, are looking for the extent to which individual attributes (education, experience, and so on) can explain wage gaps. Such studies are looking at overall data about individuals, and so they have little to say about the behavior of specific employers. In contrast, paired testing studies can be revealing for broad patterns in doing social science research, and also can point toward specific discriminatory behavior. Economists tend to like competition between firms. 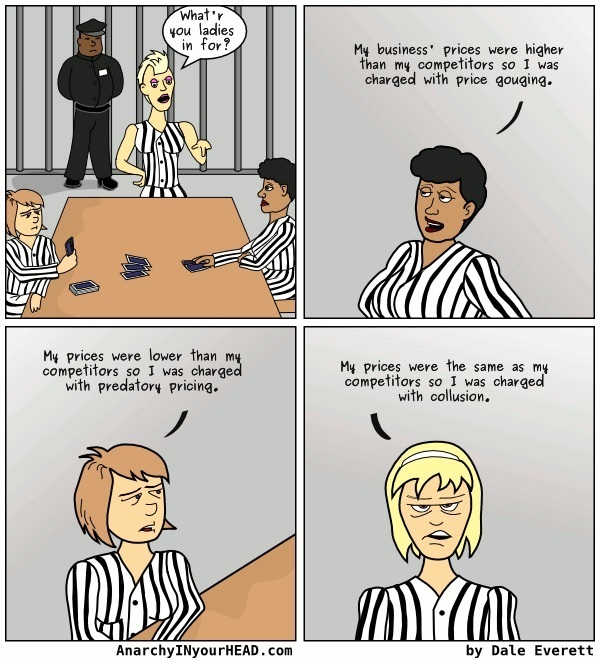 Competition between firms is good for consumers. It helps keep prices low, and it also encourages creation of new products, new varieties of existing products, and building a reputation for quality. Competition is good for workers, too. It's a lot nicer to be a worker in a job market with a bunch of different potential employers, rather than just one or two. When situations arise where it's hard for competing firms to function, like providing water or electricity to homes, economists often try to find ways to mimic the incentives that competition would provide. Thus, it's troublesome to see a range of evidence--not fully conclusive but certainly suggestive--that competition is declining in many US markets. Some of this evidence is summarized in a Council of Economic Advisers report from April 2016, called Benefits of Competition and Indicators of Market Power. The chair of the CEA, Jason Furman, discusses that report and provides some additional context in his September 16 lecture "Beyond Antitrust: The Role of Competition Policy in Promoting Inclusive Growth," delivered at the Searle Center Conference on Antitrust Economics and Competition Policy at the Northwestern University Law School. One basic way to measure the extent of competition is the share of total sales being made by the largest four or eight or 50 firms in an industry. Another basic way is to measure the Herfindahl-Hirschman Index, which involves taking the market share of the firms in an industry, squaring them, and adding them up. Thus, an industry with a giant firm that had 50% of the market, four firms that each had 10% of the market, and 10 firms that each had 1% of the market, would have an HHI of 502 + 4(102) + 10(12) = 2910. A monopoly firm with 100% of the market would have an HHI of 10,000, while a firm with thousands of very small firms might have an HHI of 100 or less. 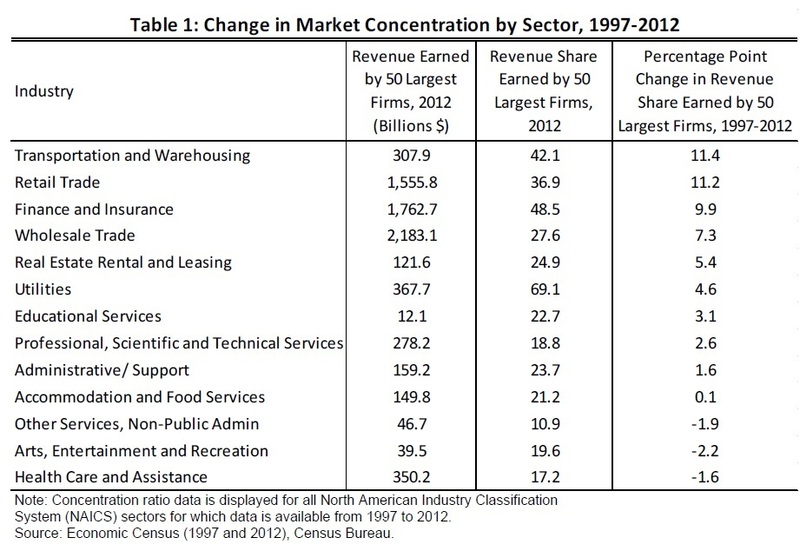 The US Census Bureau does an Economic Census of all US firms once every five years. The results for the 2012 Economic Census are now becoming available. Here's one comparison from the CEA report showing the share of sales by the top 50 firms in various industries, comparing 1997 and 2012. • In financial services, a study found that the loan market share of the top ten banks increased from about 30 percent in 1980 to about 50 percent in 2010 (Corbae and D’Erasmo 2013). 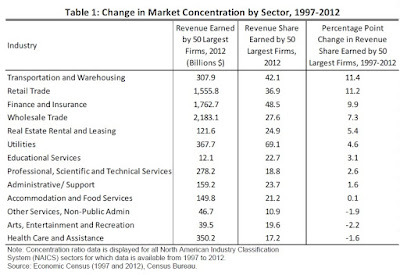 • The share of revenues held by the top four firms increased between 1972 and 2002 in eight of nine agricultural industries tracked in a Congressional Research Service study (Shields 2010). • According to Gaynor, Ho, and Town (2015), hospital market concentration increased from the early 1990s to 2006. The authors found that the average Herfindahl-Hirschman Index (HHI), a commonly used measure of market concentration, increased by about 50 percent to about 3,200, the level associated with just three equal-sized competitors in a market. • Wireless providers saw increased concentration, with the FCC (2015) finding that the average HHI in the markets they examined increased from under 2,500 in 2004 to over 3,000 in 2014. • Railroad market concentration increases between 1985 and 2007 have been documented by Prater et al. (2012). The CEA report and Furman's talk both offer a number of possible reasons for the fall in competition, but there's one reason they don't emphasize that seems to me worth mentioning. In some sectors, including finance and health care, dramatic changes in regulations have tended to increase the size of firms, because larger firms typically find it easier to bear the costs of in-depth regulations. Indeed, there are a number of cases in which large firms don't fight too hard against regulation, because they know that extensive regulation can tend to hinder or block the entry of new firms. I mentioned at the start that this kind of evidence about less competition isn't conclusive. One main reason for that caveat is that competition is really about the choices available to consumers, not the number or size of firms. To understand this distinction, imagine a situation in which the US economy has thousands of small banks, but each one operates only in a single city or town. In contrast, imagine a situation in which the US economy has only five large banks, but they are all available online to everyone in the US economy. Based on the number of banks, the the situation with many small banks might appear to have more competition. But if you are living in a given small or medium-sized town, you might have more choices with five big banks available online, rather than just one small bank that is operating in your town. Moreover, firms can a variety of pricing and information strategies so that once you have signed up with one of them, the costs of switching become quite high, and the functional amount of day-to-day competition between them is diminished. 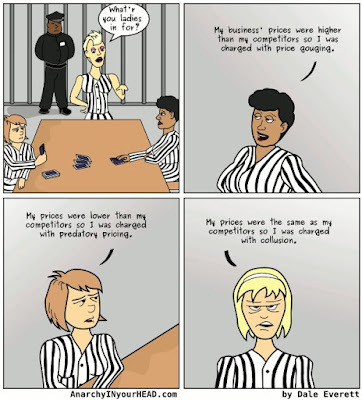 Thus, in-depth studies of competition need to look not just at number of firms or share of total sales, but at the ways in which firms are actually competing for customers--and the realistic choices that customers actually have. 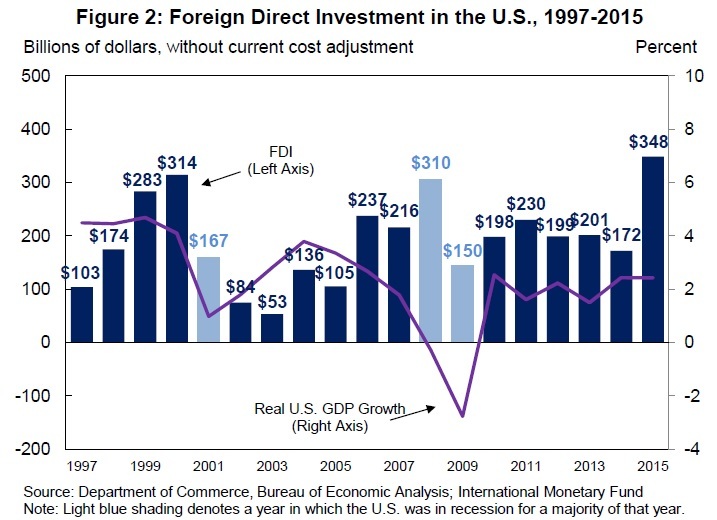 With such concerns duly notes, the US economy does seem to be going through a period of diminished competition in many markets. Consumers, beware. background checks, but only at or near the end of the employment process. Most BTB policies apply to public employers only, but seven states (including New Jersey) and a number of cities (including New York City) have now also extended these restrictions to private employers. These laws seek to increase employment opportunities for people with criminal records. They are often also presented as a strategy for reducing unemployment among black men, who in recent years have faced unemployment rates approximately double the national average ... Thus, a policy that increases the employment of people with records should disproportionately help minority men. The authors suggest that what economists call "statistical discrimination" is a possible explanation for these findings. The idea of statistical discrimination is that people might make decisions that have a discriminatory effect not out of animus against a particular group, but because they are using group membership as a marker for a higher probability of certain outcomes. Thus, it is a statistical fact that more blacks have a criminal history than whites. Consider an employer who is both mildly biased against blacks, but also would strongly prefer not to hire someone who has a criminal record. If that employer has information on whether someone has a criminal record, they will continue to be biased against blacks. But if this employer is banned from collecting information on criminal record, they will tend to act on the statistical knowledge that blacks are more likely to have a criminal record than whites. As a result, blacks without a criminal record will have a lower chance of a job callback, and whites with a criminal record will have a higher chance of a job callback. Of course, one study with fictional resumes isn't the final word on any subject. One can concoct scenarios where even if ban-the-box means that blacks got fewer call-backs, perhaps this doesn't translate into fewer actual jobs. But the evidence does suggest that advocates of ban-the-box should open their minds to the possibility that their good intentions about improving employment prospects for low-skilled black workers might in this case be leading to counterproductive results. We find that BTB policies decrease the probability of being employed by 3.4 percentage points (5.1%) for young, low-skilled black men, and by 2.3 percentage points (2.9%) for young, low-skilled Hispanic men. These findings support the hypothesis that when an applicant's criminal history is unavailable, employers statistically discriminate against demographic groups that are likely to have a criminal record. "Using LEHD Origin-Destination Employment, a novel dataset on millions of job postings, and American Community Survey data, we show that these bans increased employment of residents in high-crime neighborhoods by as much as 4%. This effect can be seen both across and within Census tracts, in employment levels as well as in commuting patterns. The increases are particularly large in the public sector and in lower-wage jobs. At the same time, we establish that employers respond to Ban the Box measures by raising experience requirements. While black men benefit on net from these changes, a perhaps unintended consequence of them is that women, who are less likely to be convicted of crimes, see their employment opportunities reduced." Here are a few illustrative figures. 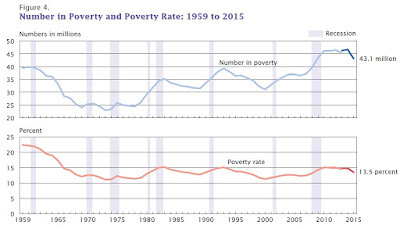 The first shows the poverty rate, with all it warts and flaws, over time. The slightly different color of the lines after 2013 is because the wording of the underlying survey was slightly altered in that year. 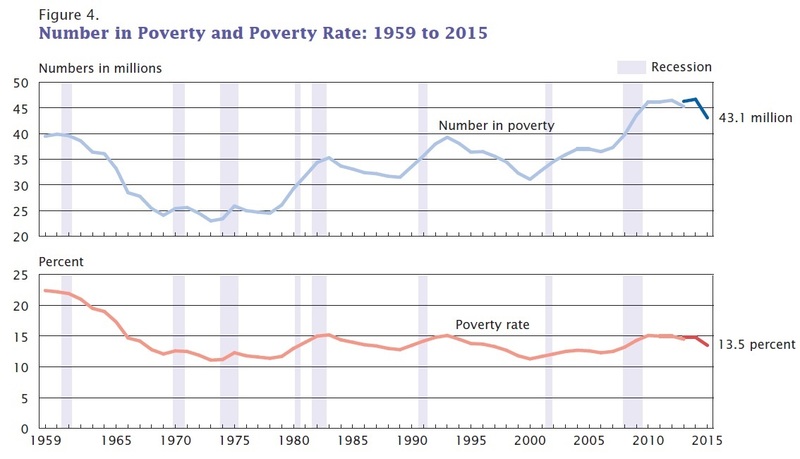 Back in the 1960s, the poverty rate was higher for the elderly than for children or adults aged 18-64. 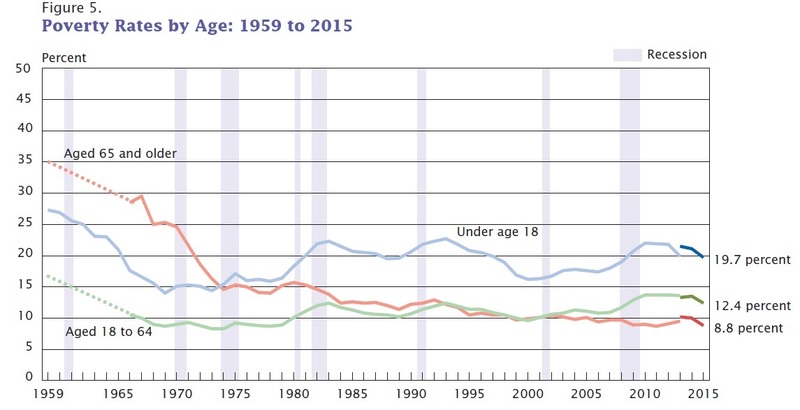 But with the expansion of Social Security and Medicare over time, and a larger share of children being born into single-parent families below or near the poverty line, the poverty rate for children has been higher than for adults since the late 1970s. 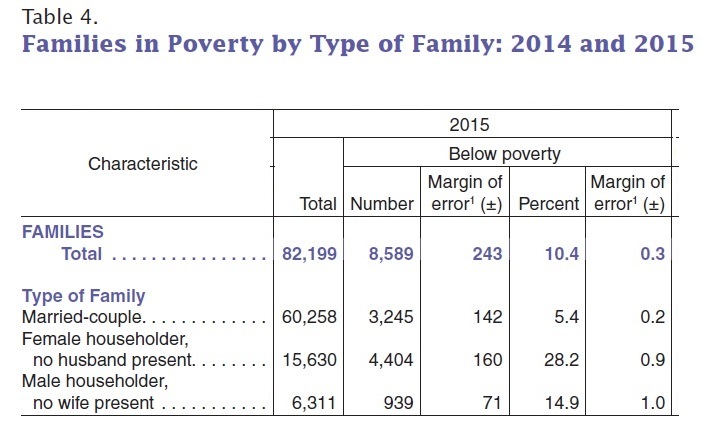 Poverty rates are also lower for married for married-couple families and especially high for families with a "female household, no husband present." First, a large body of work points toward a two- system model of the brain. System 1 thinks fast: it is intuitive, automatic, and effortless, and as a result, prone to biases and errors. System 2 is slow, effortful, deliberate, and costly, but typically produces more unbiased and accurate results. Second, when mentally taxed, people are less likely to engage their System 2 processes. Put simply, one might think of having a (mental) reserve or capacity for the kind of effortful thought required to use System 2. When burdened, there is less of this resource available for use in other judgments and decisions. Though there is no commonly accepted name for this capacity, we will refer to it in this article as “bandwidth”. [T]here are reasons to believe that the effects of diminished bandwidth are larger for the poor. Individuals in poverty are more likely to be exposed to many of these factors (e.g., malnutrition, pain, heat) and to experience them more extensively. Further, the poor are less likely to have coping mechanisms, such as direct deposits or automatic enrollments, available to reduce the negative effects of limited bandwidth. Not only is their exposure greater, but the “same mistake” is likely to be more costly for the poor than for the rich. Finally, money is a potential substitute for bandwidth. It is often possible to buy yourself the extra slack you need—hiring someone to cook and clean—or to reduce the factors which lead to lower bandwidth—purchasing a comfortable bed in a quiet neighborhood. In short, the poor do not only suffer from lack of income. They also suffer from limits on bandwidth that affect the ability to remember decisions that need to be made in the future, or "executive control" functions that affect self-control about consumption or saving, or the ability to evaluate risks and benefits accurately. There is also some limited evidence that people under cognitive stress in one area (like hunger or finances) may gain less pleasure from other activities as well--a sort of extra tax on happiness that is imposed by limited bandwidth and poverty. Understanding what policies might help the poor to help themselves, whether in high-income or low-income countries, means coming to grips with how people act when stress is high and bandwidth is low. "What we have lost in food we have gained in electricity. Whole sections of the working class who have been plundered of all they really need are being compensated, in part, by cheap luxuries which mitigate the surface of life. "Do you consider all this desirable? No, I don't. But it may be that the psychological adjustment which the working class are visibly making is the best they could make in the circumstances. They have neither turned revolutionary nor lost their self-respect; merely they have kept their tempers and settled down to make the best of things on a fish-and-chip standard. . . . Of course the post-war development of cheap luxuries has been a very fortunate thing for our rulers. It is quite likely that fish-and-chips, art-silk stockings, tinned salmon, cut-price chocolate (five two-ounce bars for sixpence), the movies, the radio, strong tea, and the Football Pools have between them averted revolution. Therefore we are sometimes told that the whole thing is an astute manoeuvre by the governing class--a sort of 'bread and circuses' business--to hold the unemployed down. What I have seen of our governing class does not convince me that they have that much intelligence. The thing has happened, but by an unconscious process--the quite natural interaction between the manufacturer's need for a market and the need of half-starved people for cheap palliatives." When discussing the poverty rate, someone is sure to point out that even most people below the poverty line in the modern United States have access to sufficient calories, television, and cellphones. 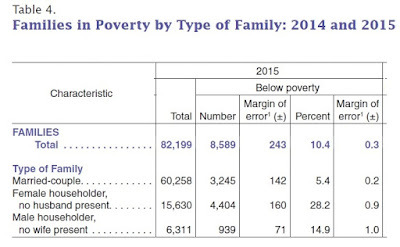 It's of course true that poverty in the modern United States isn't like poverty in 19th century Dickensian England. But it remains much harder for people in poverty, and their children, to flourish. "Recent Trends in Income, Racial, and Ethnic School Readiness Gaps at Kindergarten Entry," published in the July-September issue of AERA Open (that is, a journal of the American Educational Research Association, 2:3, pp. 1-18). "Data from three large, nationally representative samples of kindergarten students indicate that on standardized tests, income and, to some extent, racial/ethnic gaps in school readiness have narrowed over the last dozen years (see Figure 3 for summary of these trends). The declines in income gaps and White-Hispanic gaps in academic skills at kindergarten entry are moderately large and statistically significant; the estimated declines in White-Black math and reading gaps are somewhat smaller, are not statistically significant in reading, and are only marginally significant in math. 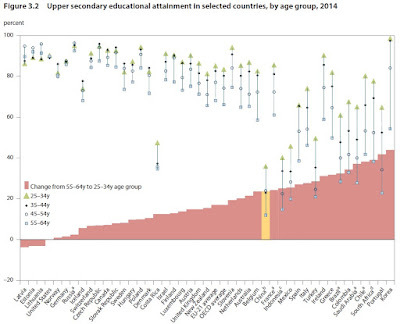 The evidence regarding trends in gaps in other measures of school readiness are less clear. Racial/ethnic gaps in teacher-reported measures of self-control and approaches to learning declined by 25% to 50%, while the income gap in teacher-reported externalizing behavior increased by 25%." "How meaningful are these changes? The income achievement gaps in kindergarten entry math and reading declined at the rate of 0.008 and 0.014 standard deviations per year, respectively, over the 1998–2010 period. To put this into context, Reardon (2011) found that the 90/10 income achievement gap grew by roughly 0.020 standard deviations per year among cohorts born in the mid-1970s to those born in the early 1990s. So the rate of decline in the kindergarten readiness 90/10 income gaps appears to be somewhere between 40% and 70% as rapid as the rate of increase in the gap in the prior two decades. Looked at this way, the rate of decline from 1998 to 2010 is not trivial. Nonetheless, the gaps were roughly 1.25 standard deviations in 1998; at the rates that the gaps declined in the last 12 years, it will take another 60 to 110 years for them to be completely eliminated. 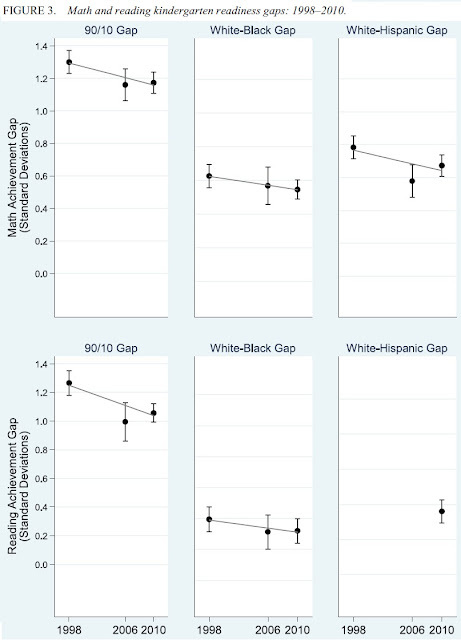 The rates of decline in the White-Hispanic and White-Black math gaps are similar in magnitude." The authors are providing evidence here, not analyzing potential causes. But they do offer some informed speculation on causes. "The most obvious candidate explanation for this decline is perhaps the changes in preschool enrollment patterns over this period. Both the income gap and the White-Hispanic gap in preschool enrollment rates declined since the early 1990s; the White-Black gap in preschool enrollment was unchanged over the same period. 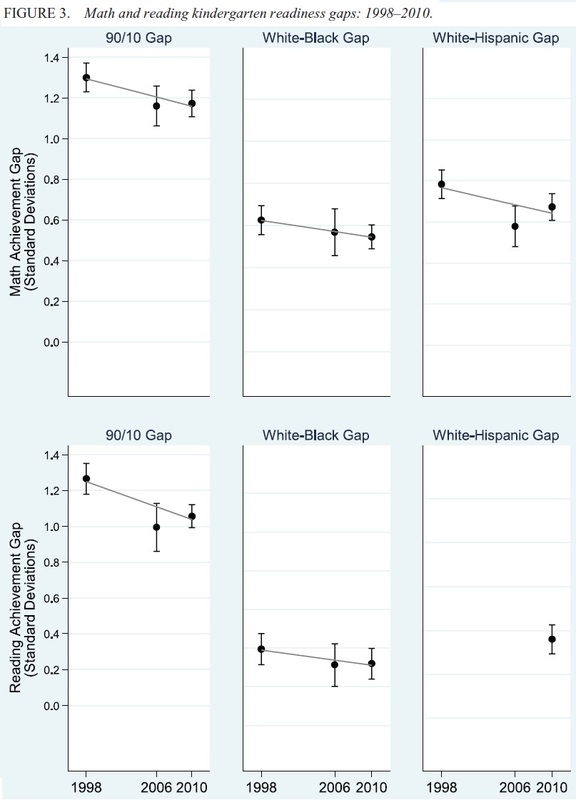 These trends are consistent with our finding here that the income and White-Hispanic school readiness gaps declined significantly, while the White-Black gap declined less (and at a rate not distinguishable from zero at conventional levels of significance). Of course, the correlation of preschool enrollment gap trends and school readiness gap trends does not prove that the first caused the second, but it does suggest that further investigation of preschool enrollment trends as a possible primary cause of the narrowing readiness gaps would be informative. We also suggest that increases in child health insurance rates among the near poor may have played a role in these improvements. Another category of explanation might be cultural changes in parenting practices that have increased low-income children’s exposure to cognitively stimulating activities at home. An investigation of these possible causes is beyond the scope of this article, however. Kindergarten readiness is quite important. In another part of the article, the authors point out that educational attainment gaps appear to have fallen for fourth-graders--but the gains are mostly because of a lower gap at kindergarten, not because schools are doing a better job at reducing the pre-existing gaps at kindergarten. "It is also useful to compare the trends in the income and racial/ethnic gaps at kindergarten entry with the trends in the same gaps as the children progress through school. Our analyses show that the trends persist through kindergarten. Moreover, the NAEP data [National Assessment of Educational Progress] ... suggest that the racial/ethnic achievement gaps trends that we observe at kindergarten entry persist through fourth grade. ... White-Black and White-Hispanic math and reading fourth-grade (or age 9) gaps declined by roughly 0.15 standard deviations between the cohorts born in 1993 and 2005, corresponding to a rate of decline of about 0.012 standard deviations per year, similar to the rate of change of the White-Hispanic kindergarten entry gap and 50% larger than the rate of change of the White-Black kindergarten entry gap. That is, the achievement gaps in fourth grade declined at roughly the same rate as, or moderately faster than, the kindergarten entry gaps. This suggests that the primary source of the reduction in racial/ethnic achievement gaps in fourth grade ... is a reduction in school readiness gaps, not a reduction in the rate at which gaps change between kindergarten and fourth grade." As I've noted in posts over the years, the evidence on how preschool improves later academic performance is weaker than I would like it to be ("Head Start is Failing Its Test," January 29, 2013; "Preschool for At-Risk Children, Yes; Universal Preschool, Maybe Not," May 23, 2013). I would like to see some additional effort put into starting and evaluating programs to affect "The Parenting Gap for Pre-Preschool" (September 17, 2013). "Hurst has used regional data in a series of papers to look at other macroeconomic phenomena that would be hard to examine using national data alone. He also has done important work on household financial behavior — including consumption and time use over people's life cycles — and on labor markets. Business startups have been another interest of his: Much has been written about the importance of entrepreneurship to the U.S. economy, but what, he has asked, actually motivates people to open their own businesses? In addition, in a recent paper, he and co-authors have attempted to quantify how much the decline in barriers to employment of women and minorities has contributed to economic growth. Among his current research interests is explaining the decline in labor force participation among prime working age males." "Most small businesses are plumbers and dry cleaners and local shopkeepers and house painters. These are great and important occupations, but empirically essentially none of them grow. They start small and stay small well into their life cycle. A plumber often starts out by himself and then hires just one or two people. And when you ask them if they want to be big over time, they say no. That's not their ambition. This is important because a lot of our models assume businesses want to grow. Thinking most small businesses are like Google is not even close to being accurate. They are a tiny fraction. "My work with Ben Pugsley has been emphasizing the importance of nonpecuniary benefits to small-business formation. Because when you ask small-business people what their favorite part of their job is, it's not making a lot of money. They do earn an income and they're very happy with it, but they get even more satisfaction from being their own boss and having flexibility and all of those other nonpecuniary benefits that come with being the median entrepreneur in the United States." Wages may be flexible at the local/regional level, even if they appear stickier using national-level data. The facts are real wages moved very strongly with employment across regions. Nevada was hit very hard by the recession, for example, while Texas was hit much less hard. Wage growth, both nominal and real, was about 5 percent higher in Texas than it was in Nevada during the Great Recession. So if you're going to just correlate employment movements and wage movements, both real and nominal, at the local level, you see a pretty strong reduced form correlation.In the aggregate time series, you don't. Wages hardly moved at all despite employment falling pretty sharply. So there are some differences in the correlations between wages and employment at the local level and the aggregate level during this recession ... When people say the reason we haven't seen real robust wage growth in the recovery is because wages were so sticky in the beginning period, I just don't think that holds water with the flexibility of wages that we see at the local level." The Great Recession is over--for skilled labor. 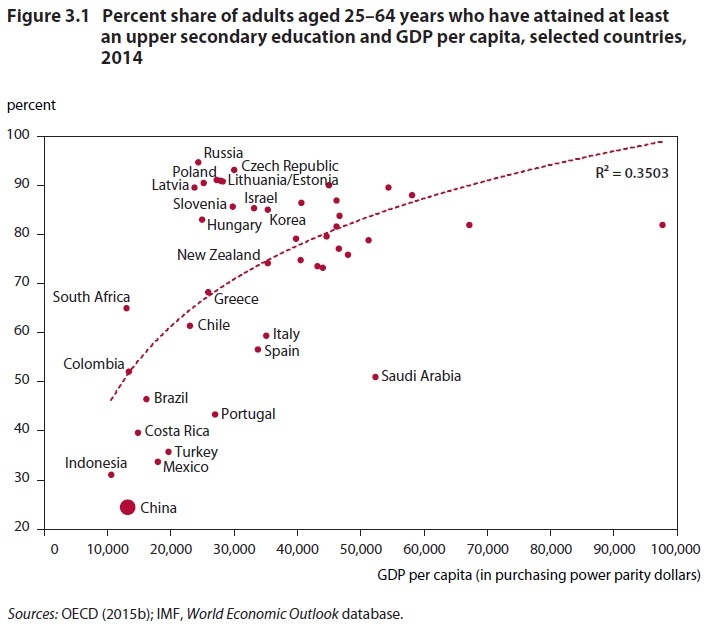 "There is a structural problem for prime-age, lower-skilled workers in the economy. If you take a look at people with a four-year college degree, you can barely see the effects of the recession any longer. There’s been no lasting effect on their employment rate. 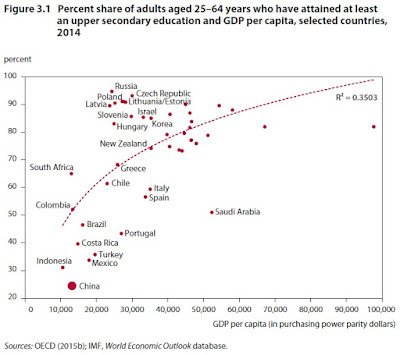 Almost all of the effect is concentrated among people with less than four-year college degrees." Do the agglomeration benefits of urban areas come from production or from consumption? "Many urban models historically assumed that agglomeration benefits usually came from the firm side. Someone might want to be close to the center city, for instance, because most firms are located in the center city. So the spillover for the household was the commuting time to where the firms were, and the firms chose to locate near each other because of agglomeration benefits. "I have always been interested in it from another angle. When we all come together as individuals, we may create agglomeration forces that produce positive or negative consumption amenities. Thinking about it this way, when a lot of high-income people live together, maybe there are better schools because of peer effects or higher taxes. Or maybe there are more restaurants because restaurants are generally a luxury good. Or maybe there’s less crime because there is an inverse relationships between neighborhood income and crime, which empirically seems to hold. So, while we value proximity to firms, that’s not the only thing we value. How important are these consumption amenities? And more importantly, how do these consumption amenities evolve over time ..."
The interview also discuss the findings of several paper that appeared in the Journal of Economic Perspectives, where I work as Managing Editor, and which together give a sense of the breadth and depth of Hurst's work. (All papers in JEP, from the current issue back to the first issue in 1987, are freely available online compliments of the publisher, the American Economic Association." "[I]f you look at the income gradient of how we spend our time, the richer you are, the less home production you do. But the richer you are, the more childcare you do. So that income gradient between home production and childcare has opposite signs, which tells me it’s not exactly the same good. Whether that’s coming from the utility you get from being with your kids or whether it’s from investing in their human capital, that’s hard to say. We know people from high-income families go to school more, go to the doctor more, and spend more time with their families. So how much of it is investment, how much of it is home production, how much is leisure, I don’t know. "I have always advocated that you should have four uses of time — market work, home production, taking care of kids, and leisure — and then treat kids as somewhere between leisure and home production." "The way I usually describe the paper, which I wrote with Kerwin Charles and Matt Notowidigdo, is to take two regions, Detroit and Las Vegas. Las Vegas has very little manufacturing relative to Detroit. Detroit didn’t have a big housing boom but Las Vegas did. ... 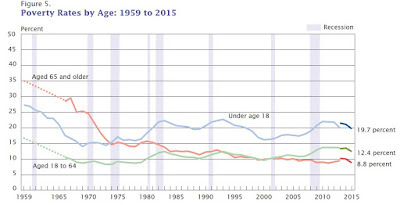 When you look at this early 2000s period, if you focus only on Detroit, you see employment rates going down, particularly among prime-age workers. It looks like there was a structural decline in employment well before the recession ever started. When you look at Las Vegas during the boom, the employment rate was well above long-run local averages. Normally, most people in their 20s and 30s work, but some of them don’t. During this period in Las Vegas, among lower-skilled workers in their 20s and 30s, nearly everybody was working. So when you put aggregate statistics together, when you sum together Detroit and Las Vegas, it looks like employment rates were relatively constant over this time period. But one was really low compared to historical levels, and one was really high relative to historical levels. "In this paper, we show that the decline in manufacturing that occurred during this period nationally — when you add in the Detroits, the Worcesters, and the Youngstowns — was masked by the aggregate housing boom in places like Las Vegas, Phoenix, south Florida, and some places in California that were growing well above average. Now one of these was temporary and one isn’t. The housing boom we know busted and then employment in Las Vegas plummeted. If you look at 2010 or 2011, the employment rate in Las Vegas is roughly the same as it was in 2000, meaning it increased and went back to trend, where the old manufacturing centers just continued declining relative to their 2000 level. You have a very temporary boom-bust cycle overlaid with a structural decline, and what you get is kind of a hockey stick pattern for the aggregate. "So for macroeconomists looking at the Great Recession, this is important for understanding why the employment rate hasn’t bounced back to its 2007 level. It shouldn’t have because 2007 wasn’t a steady state. In terms of policy implications, this means that monetary policy arguably is not an especially effective tool for strengthening the labor market. Instead, I believe you need to focus on retraining workers or investing in skills in some form. You might also want to look at disability and some other government programs that might act as a drag on unemployment." Union membership varies wildly across high-income countries. In addition, there is a phenomenon of "collective bargaining coverage," often not familiar to American readers, which measures the share of workers who are covered by collective bargaining agreement, even though they are not union members. In the US, union density is almost the same as collective bargaining coverage. But in France, only 7.7% of workers are actual union members while 98% of workers are covered by collective bargaining agreements. Here are some facts on these patterns across high-income countries from the OECD publication called Economic Policy Reforms 2016: Going for Growth. As a starter, here are figures showing the variation in the share of workers who are covered by a collective bargaining agreement (Panel A) and the share actually belonging to a union (Panel B). Just glancing at the figure should offer two lessons: 1) There's a lot of variation across countries; 2) Many of the coverage rate percentages are substantially higher than the union membership percentages; that is, in a lot of countries a large share of workers will find that their compensation is determined by collective bargaining, even though they are not a union member. 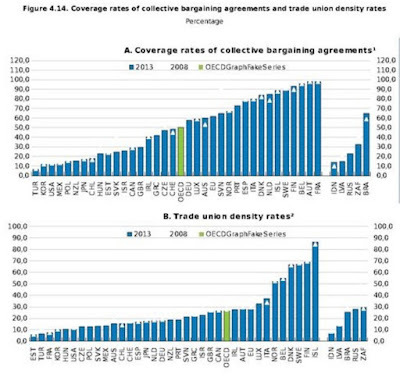 1) US levels of union density and collective bargaining coverage are lower, and often considerably lower, than in other high-income countries. 2) It seems clear that the rules governing union formation and membership differ widely across countries, as do the rules by which many workers in many countries find that their compensation is collectively bargained. In many countries, union membership and collective bargaining are not at all the same thing. 3) What people think of when referring a "union" or a "collective bargaining agreement" will differ across countries, often in quite substantial ways. For example, the idea of not being in a union, but being covered by collective bargaining, seems strange to the Americans, Canadians and British, but common to the French, Spanish, Germans and Swedes. A union or a collective bargaining arrangement that represents a small share of the workforce can focus on its own members, and pay less attention to how its negotiations affect the broader labor force. A union or collective bargaining agreement that represents most workers will need to take a different perspective. The legal and traditional powers of unions vary substantially, too. Whenever referring to unions or collective bargaining, it's useful to be clear on what flavor of these arrangements you are describing. 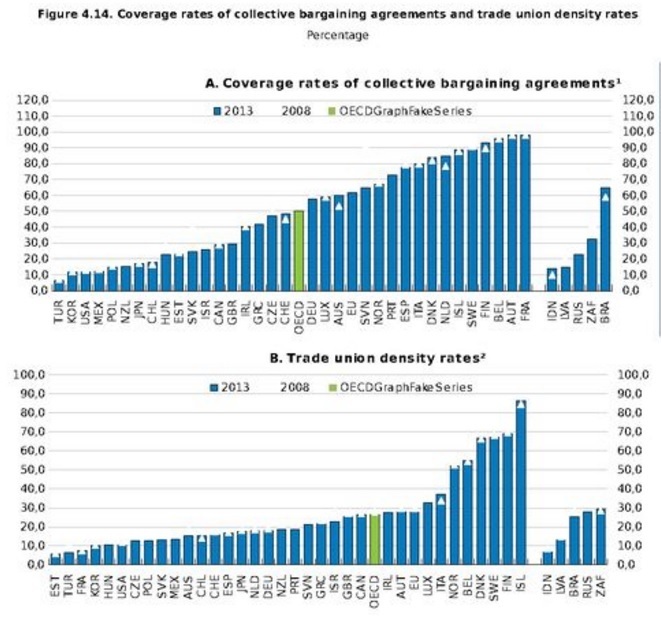 4) The OECD countris are the high-income countries of the world, which in turn suggests that an array of union and collective bargaining agreements can be broadly compatible with a high-income economy. Any labor market tradeoffs that arise are from the specific details of the institutional structure and decisions made by these unions and collective bargaining agreements.